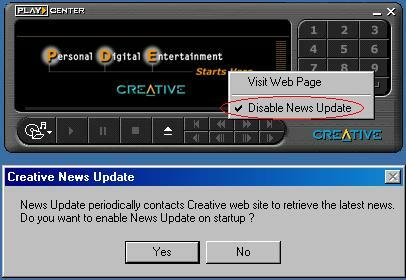 Whether considered a feature or a nuisance, getting rid of Creative's News Update can be a headache. If your MotherBoard has On-Board Audio (CT 5880) or Sound Blaster Live!Ware Drivers installed, you will have this nag installed without your knowledge! 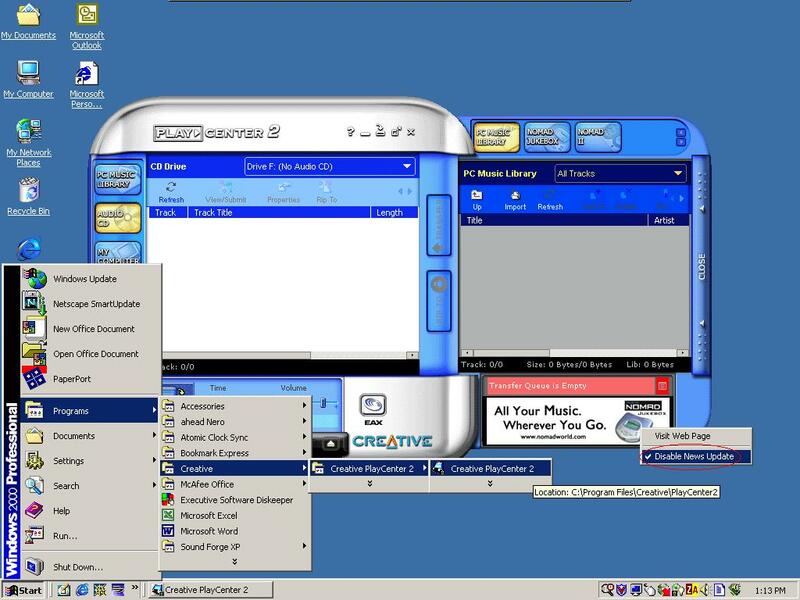 This is a problem on Win98 machines and a bigger problem on Windows 2000 machines! On Win2000 with M/B audio CT 5880, there is NO Icon running in the Task Bar. This is a process running in the background which is unable to complete therefor causing other program installations to misbehave. Verify with Win2000 TaskManager applet. Right Click on Tool Bar, select Task Manager. Creative has a Virus on their News Server web site the NewsUpD.exe applet tries to connect with. It hangs causing other problems with your system. GET RID OF NewsUpD.exe!!! You'll only get the virus if you know the URL and attempt to go there by web browser! Select, Live!Task, go to the grayed out light bulb on right side. Next... Notice the drop down menu. Click on this menu and DESELECT Monitor for LiveNews Update. 2.) From Play> Center - Right Click on the Nomad graphic. SELECT DISABLE News Update!!! From the Start Menu. Select Programs, Creative, Creative PlayCenter. Once the application initializes wait a a few seconds until you see the screen above. When the Personal Digital Entertainment Menu becomes active then Right Click on Starts Here to DISABLE News Update!!! How do I disable News Update (newsupd.exe)? Run the file C:\Program files\Creative\News\NewsUpd.exe. A dialog box will popup showing "News Update periodically contacts Creative web site to retrieve the latest news. Do you want to disable News Update on startup?" The Live! News Update program starts everytime my system starts up and leaves a blinking globe in my system tray. Can I disable it and check for updates at intervals of my own choosing? To disable Live! News Update, open Creative Launcher and click on the Live Task tab. Find the icon with the gray lightbulb and click on the downward pointing arrow to the right of it. This will reveal a drop down menu. Click on the 'Monitor For Live!News Update' until the check mark disappears. The Live!News Update program will no longer start as part of your system initialization. 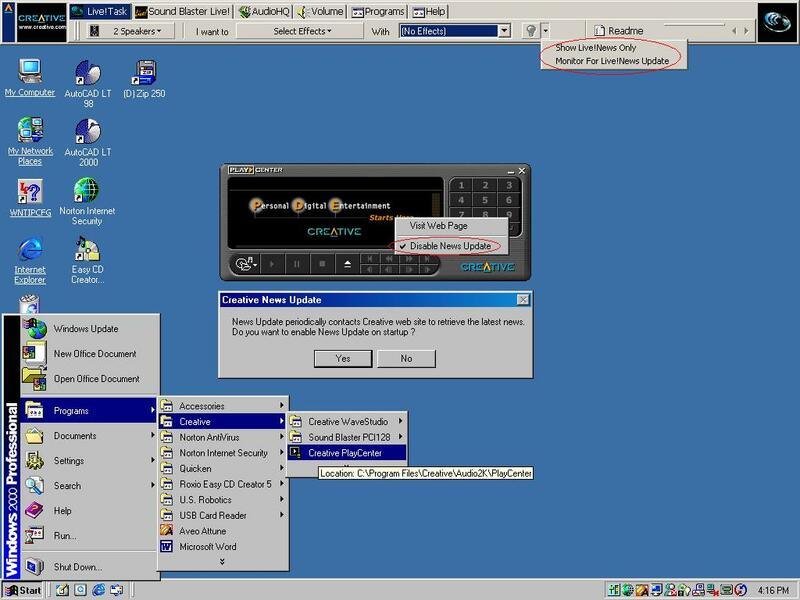 In PlayCenter 2, News Update may be disabled by right clicking on the on the Marquee below the play control keys in either Player or Jukebox views, and click to add a check mark to 'Disable News Update'. In the Jukebox view, News Update may also be disabled by right clicking on the News Screen under the Transfer Window." Search Your HD For: C:\Program Files\Creative for *.sys files. Comments: The *.sys Files (AdvServ.sys & Default.sys) are readable ASCI Text files. The Server your system is trying to connect with [creativeinspire.com] currently has a virus therefor keeping your system from updating this info and thereby hanging your PC and possibly anything you're trying to install! You will only get the virus IF you attempt to visit the URL with your Browser, so Don't!